Oh gosh and golly Lovelies! I am sorry that this update has taken so very long to post. I am running a bit behind. Our bed has been my constant companion as I recover from a back injury. This post is evidence that I am on the mend. I hope to post a January-in-review shortly. Until then, here is a little postcard I made, oh goodness knows how long ago. It was promptly sent off to the charming and delightful Mrs. Dawbis as part of an on-going (I don't know how I got so lucky) postcard trade. 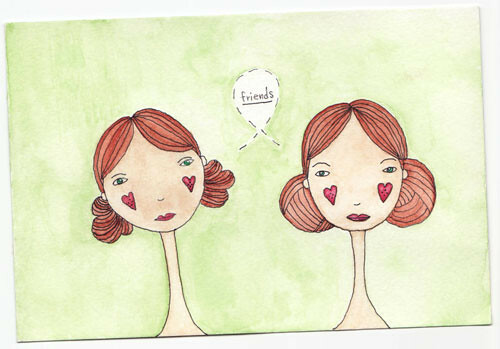 I am soo terribly pleased that we have become friends. Please know that you are all in my hearts and in my thoughts. I appreciate every kind word that you have shared with me. I have not forgotten them and I look forward to responding to them all. Hugs. xox=vv. A back injury? :( What happened? I'm glad to hear you are on the mend. And what a sweet little postcard. I am sorry to hear about your back too. I hope you get better soon. I would love to also send you a postcard, i understand if you want to keep your personal details private though! Ouch! I'm sorry to hear that you've been laid up with pesky back problems. I hope you have a speedy recovery, dear. christine, i hope you are feeling better soon! i am nearly ready to send you your package. i hope you like everything. i'm afraid it doesn't compare to yours, but i hope it will bring you some joy. perhaps another one will follow soon after. p.s. - i have this postcard in a special place! Oh hope your back feels better soon! It's so hard to be stuck in bed! Hope you can watch lots of movies & relax.